One Piece: Super Grand Battle! translations are here and there’s some interesting bits of information given here. The game will have over 85 characters (whether they are all playable or not has yet to be seen). According to the scan the stages have been “updated” to look like the manga. It’s not clear whether this game will follow the manga or the anime but more information should be revealed in the upcoming weeks. Last but not least, certain pirates can form alliances and the scan gives BlackBeard X Doflamingo alliance as an example. Thanks ArlongPark and Griffin for translating and typsetting. So this is for 3DS? 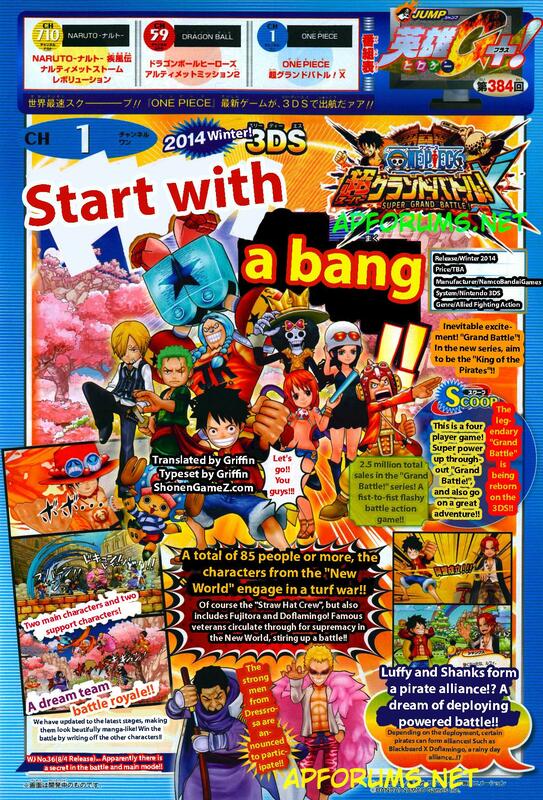 Awesome just a new Game for my japanese 3DS and more One Piece, love it. Judging from your username, I’ll guess you like Magi. The 3DS has had two games based on that series and has been a powerhouse in the Japanese video game industry for a long time being the de facto choice for licensed games whether it is football, live action shows, anime or manga. You can’t really fault the system (or the Vita which gets a good line up like Madoka Magica, Girls und Panzer and To Love Ru) for getting games if it sells to the lead market and it is also cheap to develop. I’m saying it everywhere: the presentation is very Grand Battle like but being a 2d, 4 players with supports, I’m sure the gameplay will be more like Gigant Battle, I would like to see a good playable roster but I’m fairly sure that a ton of these 85 chars will be support only like it was with Gigant Battle. If “a ton” of the 85 characters are supports, we could end up with a smaller playable roster than Gigant Battle 2 which had 100 characters in total with 40 of them being playable. Perhaps I am being too positive, definitely too positive as I got burned on Unlimited World RED (good game, not good enough), but couldn’t it actually be 85 playable characters? I haven’t bought any of the Grand Battle games, but the only thing I can see that resembles that series is 3D models in these scans. If the models were still sprites it would be debatable imo, but since they are full 3d chibi grand battle style I really think the playable roster will be somewhat modest since they’re creating every single character from scratch. And british it’s cool to see you being positive regarding the future of the op games, cause, don’t get me wrong, but you are one of the most harshest critics towards the “unlimited world red” game in the internet (that I know), maybe I’ll share a bit of your positivity to this new game. 1.Localization: With romance dawn and world red being ported and having moderate success why not. And as far as world red goes I’ll agree with British. It’s a great game on its own but not good enough. While the combat was given some expansion it also took away depth but mapping counters , dodges and guards to an on screen command all of which could’ve easily been implemented in the game without automating it. All the bug catching and fishing has been removed for rythm/sequence games which take all the patience and skill that was necessary in the wii games. Overall what was intended to be a simpler and more fun experience actually dumbed the game down alot and took all of the challenge and fun that made the wii games amazing. 3D models are cheaper to develop than high definition sprites though, Gigant Battle 2 or 3DS sprites won’t be up there but they may be saving a lot of work just from that. I’m mostly positive as it is the first scan and Ganbarion have yet to mess up on a brawler of this kind, I’ll spin around to my UWR mode if they give me something to worry or complain about come Winter 2014 and hopefully I won’t have much negative to say. Game looks like it can be very fun. 85 characters is a huge number, I reckon there will probably be PTS character versions of the Strawhats too. I really hope to see that Vivi has a place in it. Very hyped for this, thanks for the Scan and translation, ArlongPark, and SGZ!